Green and blue mods give huge bonuses to weapon damage. 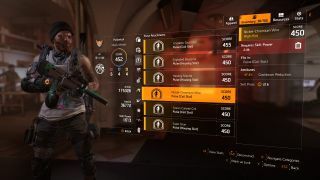 A big part of what makes the Division 2 fun is the push to get better loot. But some players have discovered that certain early-game gear is actually a lot more effective than the endgame versions. Specifically, mods that drop while your character is level 16-18 seem to have much more useful stat bonuses, and it’s possible to farm these just by rolling a fresh agent. Right now, it seems the most effective way to maximize your damage output is taking a new character at level 16 into one of the three Dark Zones to farm green and blue system mods and protocol mods. These can provide 4% or 5% boosts to raw weapon damage—much better than the high-end, high-gear score mods that add tiny boosts to critical hit chances, for instance. The low gear score on early mods doesn’t matter—you can slot up to eight of these into your armor and wind up with an additional 30-40% extra damage. Farming in the Dark Zone means you won’t have to worry about leveling your character out of the sweet spot, and once you’ve picked up enough mods to fill out your build, you can just dump them in your stash to pick up with your main character. This tactic probably won’t be effective forever. In the latest State of the Game livestream, Massive said it’s aware of the issue with low-level mods, but it’s not clear yet what if any plans exist to address the issue. It's a safe bet that they'll be tackling it in a future patch. For now at least, these blue and green gear mods seem to be the most effective way to amp up your agent’s firepower.